You Have Your 2015 Digital Marketing Recipe, Now What? by Steven Herron on December 3rd, 2014 - Comments Off on You Have Your 2015 Digital Marketing Recipe, Now What? I like to eat interesting and well-prepared meals. I worked in restaurant kitchens to help pay my way in college (washing dishes mostly!) where I watched the chefs practice their art. I learned a great deal. Am I now a chef? Hardly! 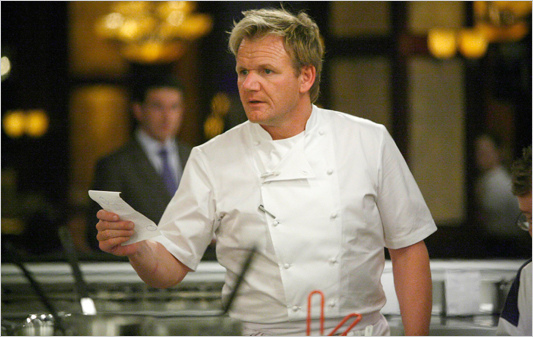 Following a recipe is fairly easy, depending on the dish, yet few of us can produce an herb crusted rack of lamb worthy of Gordon Ramsey’s (photo courtesy of celebritynewsupdate.net) praise. What then is the difference between you and me, and the great chefs of the world? We have access to the same ingredients, cookware, and kitchen appliances. The same can be said for executing a digital marketing program. Everyone has access to the same ingredients yet the results achieved can vary mightily. By now, most organizations have finished the 2015 marketing and budget planning process, and have established objectives and goals. It is those objectives and goals that can be considered the foods you wish to prepare. Each of those has a set of tactics assigned to them which could be considered the ingredients. These are some attributes required by chefs, or digital marketing teams, that are critical to producing the desired results whether it is a Baked Alaska or extending brand equity. Here are some steps to honestly assess your marketing teams according to these “ingredients.” And those of the outside sources you utilize. It may become apparent that you either need to enlist assistance from an outside source if your internal teams are either incapable in delivering at the level you want or, as more often the case, the resources you have at your disposal are inadequate. In either case, you should find a marketing partner who has the skills, talents and resources to complement those of your team. If your assessment indicates your current marketing partner isn’t delivering either through performance, service, and/or innovation, it is time to replace them with a new digital chef. Experience: HyperDisk was founded in 1993, three years before Expedia launched and a full four years before Google.com debuted. Desire to innovate: HyperDisk debuted Plan Your Stay technology in 2003 boosting client non-room revenue by an average of 38%; integrated RDFa and micro-formats for enhanced Search Engine Rankings in 2007; the integrated Social Media Lounge in 2013 which allows visitors to engage in social media without leaving the clients’ website; and launched EauPalmBeach.com in 2013 in full Parallax design (used by the video game industry to provide realistic 3D effects. Relentless attention to detail: Take a quick look at the Source code of most websites and compare them to the Source code on a HyperDisk website. This is one of the most often overlooked areas that greatly impact the performance of a site in terms of load speed, search rankings, and User Experience. The less lines of code typically illustrates the tighter the programming. To view Source code, right click on a section of a webpage and click on “View Source” in the drop-down menu. 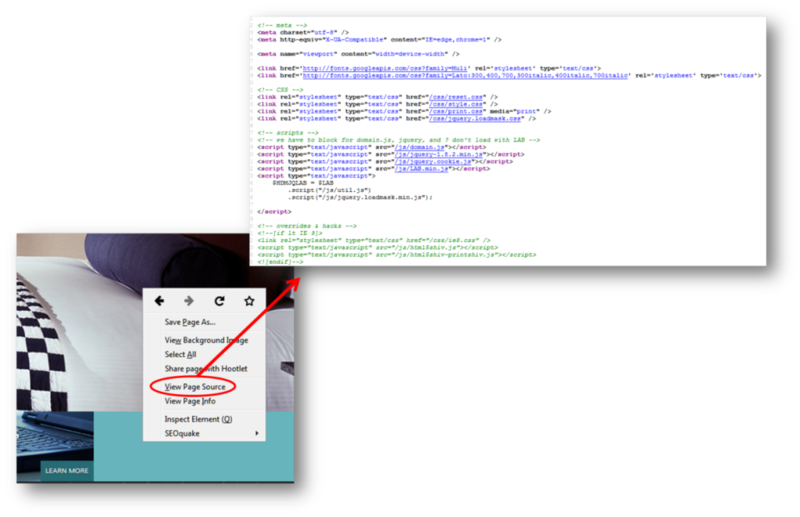 It will open up a new window where you can view the background programming for a website. Talent: This is an area of considerable subjectivity. HyperDisk is located in the high-tech corridor of Southern California and has access to some of the top talent in the industry such as Debbie Miller, our Social Media Director, who is featured contributor to Search Engine Journal, Maximize Social Business, and is founder of Social Hospitality. Think about your favorite restaurant. Smell the fragrance of the food as you enter the door; feel the ambiance surround you allowing you to relax and perhaps get a little excited about your experience; think about the chef who meticulously orchestrated every detail to insure the brand promise is delivered on every level. Do you feel that way about your digital chef?